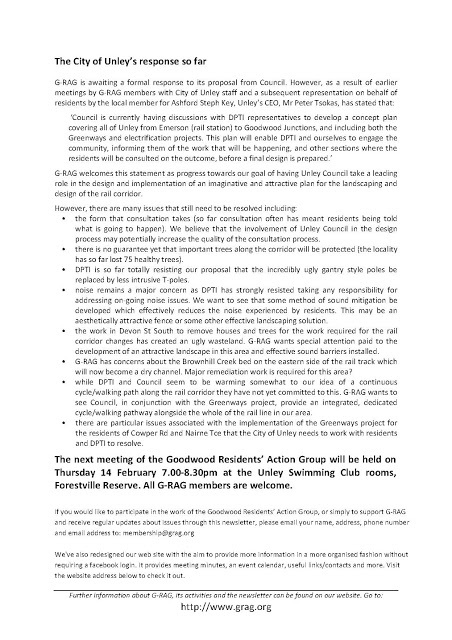 Newsletter Number 3 from the Goodwood Residents Action Group is now on their website. It's definitely worth a read to see what's happening and get involved if you wish. Want some extra money to do something special with your group. Then why not apply for a small grant from Council to do this. Applications are invited from individuals, community groups and organisations for projects and events that will contribute to the cultural life and community spirit of the City. Closing date for the March 2013 funding round is 2 April 2013. Click here for the guidelines and an application form. This is a must for all those who use the Centre or would like to but there's something stopping you that we need to know. Help us plan for your future needs. The City of Unley supports four Community Centres in the Unley area. Each Centre is unique in the types of services provided. Find out about the wide range of services and activities available at our centres. Help us plan the future direction for these valuable community resources. What makes your Community Centre special and unique? What current services and programs do you value and enjoy? What are your needs and aspirations for the future? Hard to believe but true, after at least 8 years of bickering the agreement reached by Councils late last year was yesterday signed off by the Stormwater Management Authority. That is 80% of the plan can now start being further consulted and implemented. This included 50% funding by the state government for the Ridge Park MAR. Still to be debated will be a dam in Mitcham or no-dam in Mitcham (the 20% that could not be agreed on ). The implications for Unley streets are quite different depending on the outcome of this.I expect the debate on this will escalate considerably. I recently published pictures of this log in the Black Forest PS Reserve. What a joy it was to have a resident send these photos of her daughter enjoying it! for full details. Submissions must reach Council y 3rd April. A public hearing will be held on the 15th April if you wish to be heard. (although I have been promised an answer in writing) and a statement that said the Seaford train will be running by DECEMBER and the Belair train by July. A late motion by Bob Schnell called for the reduction of speed on Leah St to 25kph during the Goodwood Junction works. This was supported as the additional truck and bus movements have dramatically increased the noised coming from the street at this time. Page Park-dismantling of the fitness equipment in an adhoc basis. Line Marking and Street Sweeping- these questions relate to assessing the recent trial regarding street sweeping and the service standards for line marking. Changes to Line Marking at corner of Mitchell and King William- the changes to east-west traffic at this location are the cause of much frustration and civil disobedience; requests have been made to DPTI to revert to the former lie making. The Local Area Traffic Management plan is now ready to start. The contract to complete the work has been won by Tonkins. Council have collected data on the volume and speed of traffic in all streets and crash data for the area (all of Black Forest). A survey will be letter dropped in the near future asking for your opinions and ideas. During the repose time a public meeting will be held at a nearby location (to be finalised) where people will be asked to share their concerns and ideas for improvement. persons interested will be able to nominate to be part of a steering committee that Tonkins can work (present options for consideration) with in coming up with a final plan. This should be finalised by mid May. More importantly Don and I have requested $100,00 be put into the budget for the implementation of the most pressing works in 2013/14. The landscaping plan for the rail corridor (Greenhill Rd to East Ave) and Forestville Reserve will be available in early March (DPTI are working with Council on these with DPTI taking the lead for the former and Council the latter). Street meetings in each locality will occur after the concept has been developed, this will be followed by a Community meeting on 24th March (venue not yet decided). After that the matter will go to Council for approval and then residents will be informed of the final outcome. Council will take the lead in designing and preparing landscaping opportunities, etc from east Ave to Emerson Xing. DPTI will add some paneling and foam to the inner side of the visual screen in Devon St, it will be sealed and a little closer to the ground. However, the gates will be open rendering this useless. No additional screening will be provided in Lyons Pde or Victoria st even though they are experiencing similar noise levels to Devon St.
DPTI will not accept responsibility for sound proofing of homes; residents have now escalated this and have askd to meet with Luigi Rossi in person. DPTI claim that even when you can see or taste the dust in the air it is not dangerous to human health. They do not require their staff to wear masks as they do not need to ! People said this about asbestos and cigarette smoke not that long ago. The arsenic in the dust is well below a level that might be harmful to human health and has resulted from weed spraying. I have now attended two Community Advisory Group meetings. After the first I thought this forum might work after last night I am very disappointed at the actions of staff. Too often the decision was to bring back more information at the next meeting: this was about landscaping, rail location, noise, dust, pedestrian crossings, the Greenways project and electrification. Just last week a flier went from DPTI to residents near Arundel Ave informing them of drainage works in the corridor, they commented that they didn't anticipate having to remove the significant trees but if they did they would let residents know. Now we're being asked to approve the removal of 3 of then and pruning of roots and canopy of others. Why not be honest in the first place, have the trees declined in health in the last week? Now they need to defend a decision when, if they had been upfront, asked residents what species of replacement tree they wanted and where they wanted them , offered to replace the screen with new materials and added additional nesting boxes for both birds and possums the decision might have been acceptable in the first place. I will write a full report tomorrow on the CAG meeting with a little more impartiality if I can manage it. The link above explains well the plight of the residents in Devon St. Many of the comments are supportive and many reiterate the necessity for the rerouting of the freight train through Truro. Please add your comments in support of these residents both on this site and on the Adelaide Now site. The following article appeared in this week's Eastern Courier. If you would like to volunteer in a progamme such as this the please let Council know. They are always looking for helpers. MORE volunteers are needed to help support socially isolated residents throughout the east. Burnside, Unley and Norwood, Payneham & St Peters councils run home and community care (HACC) services to help elderly and disabled residents with everyday chores and keep them connected to the community. About 3500 eastern residents use the three councils’ services, which are run by staff and volunteers. Burnside Council community and development services manager Louise Miller-Frost said HACC services were vital to older residents whose capacity to remain living independently was at risk. "We provide practical and social support services such as home help, personal care and shopping," Ms Miller-Frost said. "Social activities are just as important to the health and wellbeing of our older residents ... and help them to remain connected to their community." She said the council needed more volunteers for its community transport and lunch programs..
An Unley Council spokeswoman said volunteers were always needed to fill gaps when existing volunteers travelled or left the programs because of work, study or family commitments. A NP&SP Council spokeswoman said such services and programs helped older frail and younger disabled residents and their carers to stay in their homes and be connected to the community. "This is particularly relevant for isolated residents who do not have the family support or network of friends to assist them," she said. She said the council needed more drivers and assistants for its community bus and volunteers for its Stepping Out program, which partners people with an isolated resident for regular catch-ups. The councils’ calls come as Messenger Community News launches it Know Your Neighbour campaign to promote neighbourliness and reduce social isolation. Experts unite to give Unley a vision splendid. An interesting article appeared in the SA Business Journal in today's paper. As I have blogged earlier Council initiative in creating new section 41 committees with independent members on each committee is now being closely watched by others to see if and how it will work. Chairpersons have now been trained and the rules of engagement agreed upon. The first meeting will be next Tuesday, that being the Community and Culture committee. Elected members who are not on the committee will be able to participate by asking to make a deputation on any item on the agenda that they wish, but will not be able to enter the debate. Independent members will always be in the minority so while able to give valuable advice they will not be able to outvote elected members. (This is unlike the Development Assessment Panel where the rules have been set to ensure that independents can outvote elected members). Tim Horton is quoted as saying "I am convinced that this is the magic moment when strategy,capability and ambition align...Our inner metros are transforming as we speak and it's great to be part of the effort to bring more shoulders together to convert dreaming to reality'. Please take the time to look at the G-RAG (Goodwood Residents Action group) blog regularly. There is plenty to read about the problems associated with the Goodwood Junction, rail revitalization (electrification) and Greenways project. The soon to be actioned Wayville Station I'm sure will have its problems as well.If you want contact directly from them then take the time to become a member and attend their meetings. Sorry I can't fix the formatting errors. good spread of people with many new faces. 2. Brief report of what has been done by the coordinating group since last meeting. campaign on this issue was the focus of the second G-RAG newsletter. Facebook account.The second newsletter is now on the website. Thanks to Ashford Electoral Office staff and Steph Key for sending out our first newsletter and invitation to join G-RAG. 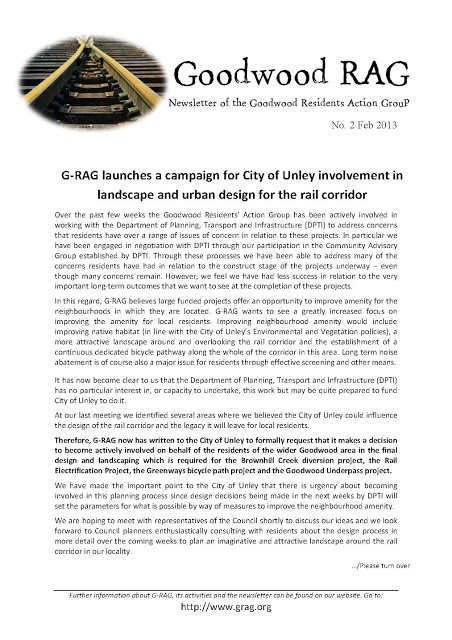 As decided at the last meeting Kathy has sent a letter to the Mayor of Unley on behalf of G-RAG urging the City of Unley to become involved in the planning of landscaping an amenity development around the rail corridor. No formal response as yet. Copies sent to John Devine and several councilors. 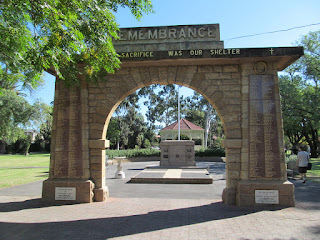 However Ray reported there had been a letter from Unley C.E.O. in response to Steph Key’s earlier letter on behalf of Cromer Pde residents. Peter Tsokas stated that Unley was starting the process of working with DPTI on landscaping (see website for correspondence). As decided at the last meeting Sal has sent a letter on behalf of G-RAG to John Devine (Unley’s Manager of Infrastructure) urging him to attend CAG. No formal response yet. high level of squealing. It was agreed that the noise from many of the freight trains was not acceptable. on residents along the bikeway. 3. Brief report on Community Advisory Group meeting on 6th Feb. Ten members of G-RAG attended the last meeting of CAG. this be a future rule when formulating agendas. Luke has researched incidents of suicides at these types of crossings – DPTI will give more details later. at Victoria and Leader St. crossings? Planning for Unley. Trees should be returned to neighbourhood affected by works. website and give to C.A.G. and Michele with suggestions. planted in areas where most have been removed. Sustainability & Conservation – address letters or emails to him. meeting (available with the minutes on the website). Issues occurred during the construction stage and in the long term and strategies need to reflect this. complaints up with some data. • Trucks do not need to use exhaust brakes if obeying suburban road limits - get CAG to fix this. insist a ‘phone line’ is set up to take residents complaints (ii) meet with C.E.O. of E.P.A. • Hay bales to be used as immediate temporary solution for Devon Street and others if necessary. Need to raise this with CAG and ARTC which manages freight line. and habitat lost in the Goodwood area. handed back to the Unley Council. investigate getting hay bales for Devon St.
will pass residents’ letters or emails on to relevant Ministers and these will be used to as questions in Parliament on the issue. The next CAG meeting will be next week (Wed Feb 20). 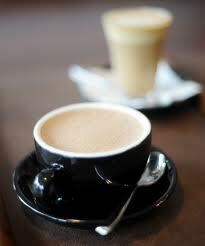 Are you looking for a great place to eat out,have coffee, get a good take away or something special to take home? If so Unley has just released a small booklet and now uploaded website with all of these establishments listed (http://www.unley.sa.gov.au/webdata/miniSites/taste/index.htm). The booklets are available from the front counter, all Council facilities, some stores and shop fronts as well as hotels and motels. Somehow, restaurants in Goodwood South are described as "Off the beaten Track". Nevertheless, its a great little book if you want to experience the variety that Unley has to offer. This follows the recently launched website findyoureverything.com.au that is gaining great success and bringing increased traffic via the web to many businesses. The residents along the railway line are now insisting on some sound protection for their homes. DPTI have continually refused this as they claim after they have finished their works the sound from trains will be less than it was before. While this may be argued logically in some areas (although I still think even this argument is unwinnable) it certainly is not the case in others. The residents in Devon St are now experiencing continuous loud noise 7 days a week. This noise will continue for at least another 7 months and when complete they will face the rail line instead of having a row of houses between them and the line. If DPTI resell the properties the residents will then have building and construction noise for another 12 months. Clearly it is crucial for these people to have sound amelioration now. 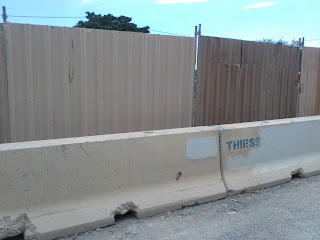 This should mean a fence between the works and homes that is continuous (no gaps) and sealed to the ground level. What has recently been added is only a visual screen. The homes should also be provided with soundproofing to all windows and doors that face the street.. This will then set a precedent for other affected homes as the works move further south into Millswood and Black Forest. As the diversion of Brownhill Creek has progressed I have watched with interest the building of the culvert wondering at what point and when the new works would be connected to the original creek channel The picture shows that this is now, however my question is what happens if we get a decent storm? This is what is now constructed where the house was demolished on Victoria St. I have recently noted the pile of wood behind the pool in Forestville. 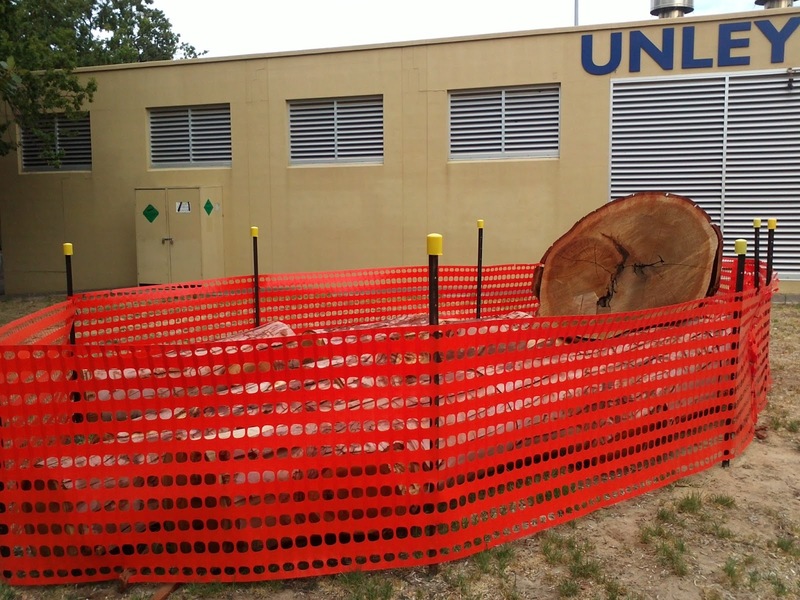 Hopefully, this is the remainder of what of the trees recently removed during the DPTI works. 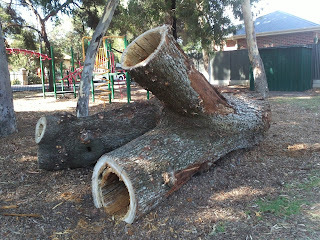 This wood should be waiting for recycling as landscaping in Unley Council projects. 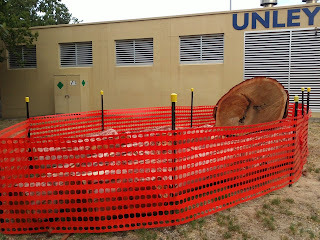 After taking another look at he grey box trees behind Forestville reserve (on private property) I saw this huge piece of tree having recently been located near the playground. It even has a sign requesting children to wait to discover it's mystery until after the bugs and spiders have found a new home. The report on the preservation (or not) of the grey box trees will be debated by Councillors at the meeting on Feb 25th. Unley between now and April. about what makes a space ‘a place’ for us. bring their distinctive style of rocking, popping, Indie and sometimes raunchy music. place and space and question what makes our sense of place unique. Gardens, 9, 16, 23, 30 March and 6 April. Today I had the pleasure of attending the Merit ceremony at Government House. My achievements at work are achieved by the same advocacy role that I play as your Ward Councillor coupled with a good deal of initiative and ability to talk the talk. This is the first time I have ever attended and it was an honor to represent my school. It was also amazing to see one student, just starting year 12, receive a merit for Work and the Community; the student is autistic and has worked against the odds to achieve this. In the afternoon I attended the Supported Residential Facilities Advisory Group as a member for the first time, representing Local Government. 2013/14 Initiatives: What do you want? Each year Councillors are asked to put in their wish list for funding in the following year's budget. 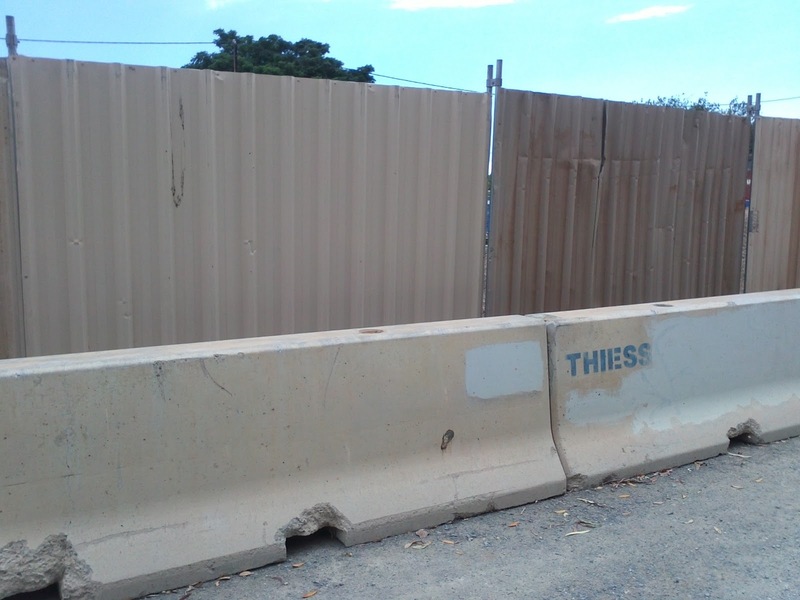 Items that have been funded in this manner are the Local Area Traffic Management study in Black forest, the upgrading of the facilities at Clarence Park CC (toilet, bathroom and kitchen)and some works at Goodwood Oval fencing at the playground and repairing the embankment). This does not include the footpath budget. Ensuring sufficient funds are available to run the bike path at Chromer Pde between the trees and the fence if DPTI do not provide the money for that section. Greening William St on at least one side. Tree replacement in Langdon Ave.
Now it is your turn, what do you want? Remember it is a wish list and not all (or even any) may be funded. One of the reasons Black Forest has such abundant bird life. 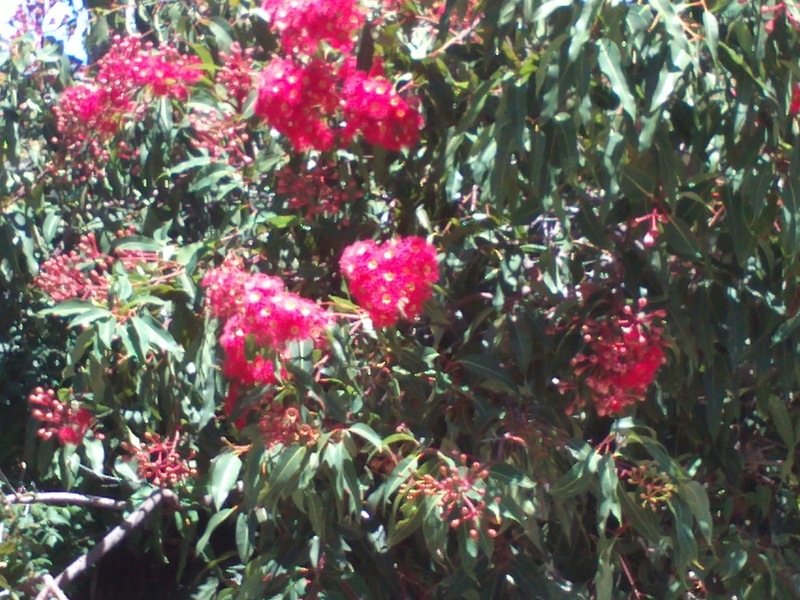 I'm not much of a photographer but this blossom in Hartland Ave was just buzzing with bees and according to the resident usually full of parrots as well. Got a concession card and would like to get your cat desexed? 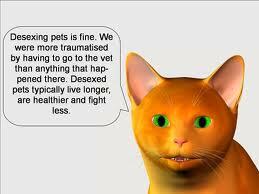 Save up to 55%* through the RSPCA's Cat Concession Desexing Program. Discounted Rates apply for all concession card holders. Male cats $65 and female cats $85! Tell your family and friends because at these prices, can you afford not to get your cat desexed? *Based on average price for female desexing. Discount applies to current concession card holders only. A landscaping plan is being developed this will include offset vegetation in the tram corridor, Chromer Pde, Goodwood Oval, Millswood Park and the train corridor; I still wasn't given an assurance that Unley had a roll in this although this must be resolved as soon as possible,. As well trees damaged will be replaced or pruned depending on the extent of the damage. A opportunity to distinguish between what is described as landscaping and what is urban planning?It seems landscaping is plants, the rest is urban design. A suggestion that information and displays should be in the libraries and community centres. I have discussed this with staff and this will occur as soon as practicable with the supply of information from DPTI. Dilapidation reports requested by residents have been sent out. Dust readings show that on some occasions the dust levels have risen above 0 units/square metre. Some people expressed concern about this as there is not a clear understanding as to why DPTI chose 60 as the number that was acceptable. The crossing at Fairfax Ave when completed if proposed to be at grade rather than an overpass being constructed. Residents are very concerned about safety and noise. Sound barriers in Devon St. So far these residents would seem to be most affected by the works. Not only will this continue throughout construction but may also if the acquired land is sold for new housing. These residents have had their amenity destroyed in the short term and are holding out little hope in the near future. What will happen to Lyons Pde if the freight line is moved, as planned, to to the west? Is it possible to divert the traffic from Leah St? The noise and volume of trucks is becoming unbearable? Above is the latest G-Rag newsletter. The switch to Unley Council taking more responsibility in what happens is duly noted. I have pushed for this since after learning at a recent Cromer Pde meeting that Council would be asked to design and manage implementation of the landscaping in the train corridor, as well as the design and location of the cycle path. Up until that point Council's responsibility was to be only the maintenance of the landscaping when complete. I am meeting with both Peter Tsokas and John Devine on Monday to discuss the role that the Infrastructure Committee will play in decision making in this process. One of the questions here I can answer and that is that in the short term water will be pumped from the rail cutting into the dry creek bed rather than the culvert. 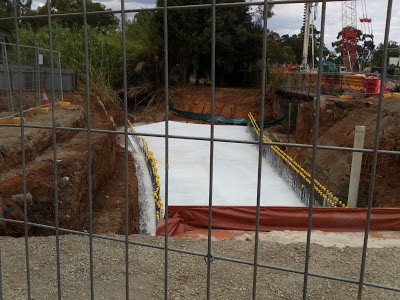 In the longer term the old creek bed will carry the water collected from Arundel Ave, Malcom Ave, the rail corridor and Mitcham-that is when the Stormwater Management Authority signs off on the current plan before it and when the culverts upstream are constructed. This might be as long as 5-10 years. The MS Mighty Swim, is being held this weekend at Unley Swimming Centre. This year is the eighth year that the swim has been conducted . The event, which involves teams doing swims for 24 hours. 400 participants will swim in the event and registrations are still open. The Multiple Sclerosis Society is hoping to raise over $100,000 this year. The money is used for community exercise classes for those with MS.
PEOPLE power must help sway Unley Council to limit proposed building height increases, a residents’ group says. The council has proposed a 10-storey height limit on Greenhill Rd west of Goodwood Rd and seven-storeys on Greenhill Rd to the east of Goodwood Rd up from three storeys. It also wants to see buildings up to five storeys on Unley Rd, up from two storeys, as part of its Development Plan Amendment. The changes are being made to fit in with the State Government’s 30-Year Plan which predicts a population increase of 560,000 people in Adelaide. Friends of the City of Unley Society president Ros Islip has labelled the heights excessive. Mrs Islip said they would not blend in with Unley Rd’s streetscape of predominantly single storey and heritage buildings. Tall buildings would block AL adelaidenow. MESSENGER WITH com.au AL neighbours’ sunlight and views and invade privacy, she said. We’re waiting to hear what our members and the public think but I would think a limit of three on Unley Rd and five to seven on Greenhill Rd would be preferable,’’ Mrs Islip said. She also said, in all cases, residents should be notified about nearby developments. Under the amendment, residents will only be notified if land use is outside of expectations or the building height is exceeded’’. If it is approved you could get 10 storeys built on Greenhill Rd and, if it met all the specifications, nobody would be notified,’’ Mrs Islip said. Goodwood South Ward Cr Don Palmer, who has many years building industry experience, encouraged residents to speak up. The society will hold an open meeting on the plan with Unley Council’s principal planner David Brown at Unley Citizens Centre on Thursday, February 7, 7.30pm. Public consultation on the DPA closes on Friday, February 22. My comment is that Council need enough evidence to convince DPTI that what they propose and have insisted Council go to consultation on is not what people want. A compromise position on setbacks, potential over shadowing and height limits can be reached and still provide for the addition housing that the government desires. 1. Why is it that not one mention has been made of the fact that the overhead gantries for electrification do not fit in the rail corridor and are being installed on Nairne Terrace at Forestville? Essentially, the corridor is not wide enough in this location and Nairne Terrace poses some intricacies of its own (it is a narrow street, with on street parking, driveways and is required for two-way cyclists as part of the greenways project). We also need to make sure the garbage truck can pass parked cars. To this end, DPTI has commissioned a set of artists impressions to determine the impacts of barrier options and to date we are not happy with any of the options that have been developed. DPTI is continuing to work to find the best solution for any portals that will need to installed at Nairne Terrace, Forestville. It must be noted, that because of the space constraints afforded by the rail corridor on the ARTC side, it is likely that there will be some kind of protuberance in the street but this is expected to be less than half a metre. The electrification project is being implemented from Seaford toward Adelaide and the design is progressing in this sequence, the detailed design for this area is still some months away. This is one of the more challenging design issues that the project is facing and when DPTI is comfortable with possible design solutions, will recommence discussions with residents and the council. 2. The residents have no idea that this is going to occur. There was a notice letterboxed last week regarding "pilot hole drilling" that is happening this week, however it is not to be found on the DPTI internet site like all the others. Pot holing works were undertaken on Nairne Terrace on 4 February 2013 to confirm that ground conditions were suitable for future under-track boring works (ie that it does not contain rock and also to identify the depths of common services). At a later stage DPTI will need to undertake directional drilling at this location to relocate cables from overhead to underneath the rail tracks. The relocation of overhead cables has occurred at many other locations along the rail corridor. Thought you mind find this letter from the Dog and Cat Management Board interesting? Each year the Dog and Cat Management Board collates statistics, conducts surveys and reviews research from Australia and around the world to help inform strategies and policy advice for South Australia’s dog and cat management. Over the last two years, the Board has paid particular attention to researching various management interventions that can reduce the risk of dog attacks in our community. Sadly, there have been 19 dog attack related incidents reported in the media in the last six months ranging from a small boy losing his nose, to an elderly lady being rushed at by a dog while walking her own dog, falling and breaking her arm. Children aged 0-9 at the highest rate of admission for dog bite related injury representing 27% of total admissions. While those figures are alarming, Omnibus surveys further indicate that at least 80% of injury caused by dogs goes unreported, consequently actual injury in the three year period surveyed is estimated to afflict 2.1% of the population. That’s approximately 11,500 South Australian’s a year. The Board considers dog bite injury to be a human health issue and preventative interventions have been the focus of the Board’s research. We thought that you would be interested in some of the findings and enclose a summary of our research titled Mitigating the risk of dog related injury in our community for your review. If you would like to learn more about any of the research, policy or interventions included within the executive summary, contact the Dog and Cat Management Board on (08) 8124 4962 or at dcmb@sa.gov.au. I can send you the full paper if you would like, just let me know. As you are aware, construction work to upgrade the Noarlunga rail line commenced on 2 January 2013. The upgrade of the rail line will include upgrading 13 kilometres of track from Oaklands to Adelaide by installing gauge convertible concrete sleepers, new ballast, new and refurbished rail, upgrading eight level crossings and improving drainage. As part of this project, it is necessary to close some pedestrian crossings temporarily throughout the construction period to ensure work proceeds safely and efficiently. The pedestrian crossing located at Gordon Road, Black Forest will be temporarily closed for approximately 8 weeks from early February 2013 with no pedestrian access available at this location. Alternative pedestrian crossings are located at the city end of Emerson Station and at Cowper and Homer Roads. Pedestrians are advised to only cross the railway tracks at designated locations as construction equipment will be operating in the rail corridor. Every effort will be made to minimise disruption to residents, however some construction noise is unavoidable. We recognise that reversing beepers on site vehicles are often disruptive, however for safety reasons they cannot be switched off. The disruption is moving further south. This was recently letter boxed in the area adjacent to the crossing. Unley Business and Economic Development- Chris Vounasis, Phillip Brunning, Andre Stuyt, Andrew Barr and Gabrielle Leoello. · · Will there be facility for access by vehicles to the train line from Cowper Road when work completed? · · Lighting – distance between poles, height of poles, any deflection or reflection into residents homes or gardens. Is the lighting solar powered? How long will the lights be on during the night.? Residents of Lynton Ave have until Feb 8th to comment on the installation of pavement bars at the intersection with Millswood Cres. It is hoped the installation of these will stop motorists cutting the corner and creating an unsafe environment. The kerb and water table is currently being replaced in East Ave, near the train line. Some have asked what is being built on the vacant lot on the other side of South Rd? after an email to Tim Pfeiffer Councillor for the Glandore area he tells me that 'The vacant Weeks Peacock site has a DA to become a renovation company showroom with office and car park. It has been quite a controversial site and previously had a car wash facility slated, but the local community wasn't keen on this (long story!)'. Further requests have been made for line marking the parking bays in Aroha Tce. This will guide people to allow more parking and, hopefully, not get one car thoughtlessly parking over 2 spaces. This is now on the work list for the line marking team. Tell us about your experiences with wildlife in your gardens! The City of Unley has limited open space. It is important that as a community we use our open spaces in a way that is sustainable and productive. One way of doing this is by ensuring we have a variety of habitats available for our local wildlife to live in. We are looking at improving the habitat available to our local birds by encouraging residents to consider 'bird friendly' gardens with a range of plants (trees, shrubs and undergrowth) to provide food and shelter, and a water source such as a bird bath. 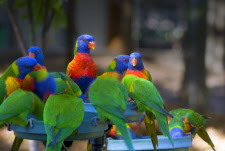 If you are interested in finding out more about how you can help your local community create a bird friendly environment, please participate in the discussion boards below. 'The Department of Planning, Transport and Infrastructure would like to acknowledge the representations received from members of the community about the Sugar Gum trees on Cromer Parade. A number of rail projects will impact vegetation, including electrification, signalling, and the Greenways Cycle Path. A committed team of environmental officers are working with designers to explore options, and there are a number of design constraints to be considered. DPTI is also engaging an independent arborist to assess the trees to ensure their retention wherever possible. DPTI will continue to provide updates to the community as soon as they become available, when details of the design are confirmed. These comments from the DPTI website show some empathy to the plight of the trees. However, no undertaking has been given that all can be saved from either removal or pruning. These make a beautiful avenue and are an invaluable habitat. They are also worth fighting to retain and the Cromer Pde residents are prepared to be very active in ensuring their retention. The following is a summary of the actions so far by Council regarding Forestville Reserve and the necessity for creek works following a government decision to divert Brownhill Creek to enable the train underpass at Goodwood Junction to be completed. To look at the diagrams and complete the survey please click the link included. Work on the Goodwood Junction Rail line commenced earlier than expected, meaning the new culvert to divert Brownhill Keswick Creek is being installed between the end January and mid February 2013. To coincide with the works on the new culvert, Council is taking this opportunity to plan for an upgrade of Forestville Reserve. Following on from a public meeting on 18 December 2012, Council is now seeking community feedback on the reinstatement of the recreation facilities, the final appearance of the new culvert opening, and the future development of the reserve. Consultation commenced on Tuesday 29 January and will close on Tuesday 12 February 2013. It is intended to present this plan to the community for their input by the end February 2013, with a final plan being prepared by the end March 2013.